At the invitation of Premier Li Keqiang, Prime Minister Lars Lokke Rasmussen of the Kingdom of Denmark will pay an official visit to China from 2 to 5 May. During the visit, President Xi Jinping, Premier Li Keqiang and Chairman Zhang Dejiang will hold separate meetings and talks with Prime Minister Rasmussen and exchange views with him on bilateral relations as well as issues of shared interest. Denmark is among the first Western countries to establish diplomatic ties with the People's Republic of China and also the first North European country to establish comprehensive strategic partnership with China. China and Denmark enjoy a long history of exchanges and a solid foundation for practical cooperation. The China-Denmark relationship is developing with a sound momentum. We believe the visit of Prime Minister Rasmussen will enhance political mutual trust, expand and deepen practical cooperation, bring the bilateral comprehensive strategic partnership to a new height and lead to new progress in cooperation between China and North Europe. Q: It is the foundation day of the Korean People's Army of the DPRK today. All sides think the DPRK would conduct the sixth nuclear test, but it hasn't made any unusual move. Is this because China has urged the DPRK to remain restrained? What message does China want to convey to the DPRK? A: The DPRK has not conducted a nuclear test today, and you sound very disappointed, don't you? (laughs) In China, we have such a sentence to describe someone who would like to see nothing but instability. Your question does make you sound more or less like such a person. As for whether China has any message to convey to the DPRK, what I can say is that China and the DPRK have maintained normal exchanges with very smooth diplomatic channels. Since all of you and the DPRK are familiar with our position of "three commitments" on the Korean nuclear issue, I will not repeat it. Here I would like to reiterate that the situation on the Peninsula is complicated and delicate and the tensions are high. We urge all relevant parties to stay calm and restrained and refrain from any action that may aggravate the tensions. Q: It is reported that on 20 April, an Indonesian marine patrol boat detained a ship of Chinese origin Chuan Hong 68 off the waters of the Riau Islands Province, accusing it of illegal activities including underwater mineral exploration in the waters of Indonesia. 20 crew members have been detained, including 17 Chinese citizens. Could you provide more details? A: We've noted relevant reports. The Embassy of China in Indonesia has communicated with the Indonesian side about this matter. From our initial information, Chuan Hong 68 is time-chartered by a Malaysian company called "Accenture Strategy Sdn. Bhd. ", and has been engaged in offshore engineering in the waters specified by the Malaysian side according to the contract. The Chinese side hopes that the Indonesian side can coordinate with the Malaysian company to settle the issue and take credible steps to ensure the safety and legitimate rights and interests of the Chinese citizens detained. Q: The Japanese foreign minister announced today that Special Representative of the Chinese Government on the Korean Peninsula Affairs Wu Dawei would visit Japan to have talks with senior officials of the Ministry of Foreign Affairs of Japan. Can you confirm it? What is the purpose of the visit? A: Special Representative of the Chinese Government on the Korean Peninsula Affairs Wu Dawei will visit Japan today, the main purpose of which is to exchange views with the Japanese side on the current issues on the Korean Peninsula. 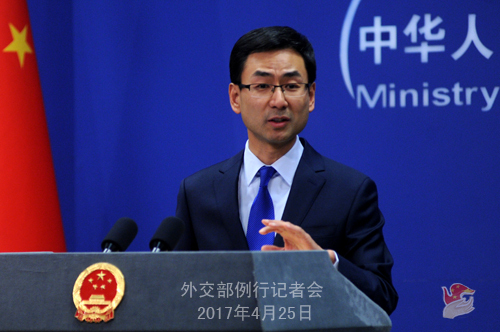 As a country in Northeast Asia and a responsible member of the international community, China has been making its own efforts to properly and effectively resolve the Korean Peninsula nuclear issue. We hope Japan and other relevant sides can work together with China to play their due role, make due efforts and shoulder due responsibilities for the early peaceful settlement of the issue. Q: The US media CNBC reported that opium production in Afghanistan in 2016 rose by 43 percent compared to last year, hitting a record high. The report also said that UNODC officials attributed it to the use of genetically modified poppy seeds from China. What is China's response? A: We've noted the relevant report, which is not true. China has never exported poppy products to Afghanistan or planted the so-called "genetically modified poppy". From our information, relevant UN agencies and Afghan authorities haven't confirmed the so-called "genetically modified poppy seeds" and have made no remarks on any specific country about the issue. The Chinese government holds a firm stance on combating drug crime and illegal planting of poppies. We have actively participated in the international counter-narcotics cooperation and provided assistance to Afghanistan within our capacity to help it enhance counter-narcotics capacity-building. 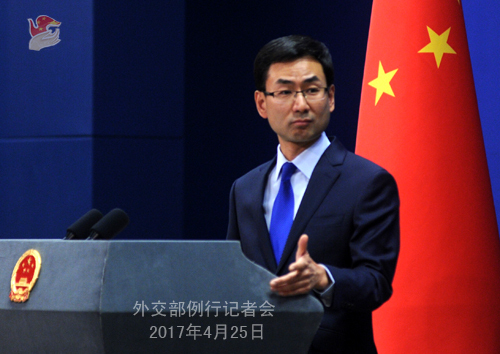 China will further deepen counter-narcotics cooperation with Afghanistan and other regional countries and safeguard a healthy, secure and peaceful living environment for people in the two countries and the region as a whole. Q: Japan said a leader of the Liberal Democratic Party would attend the Belt and Road Forum for International Cooperation in May. Besides, the chairman of the Japan Business Federation and the Japanese minister of international trade and industry are considering accepting invitation to the Forum. What is your comment on the Japanese participation at this level? 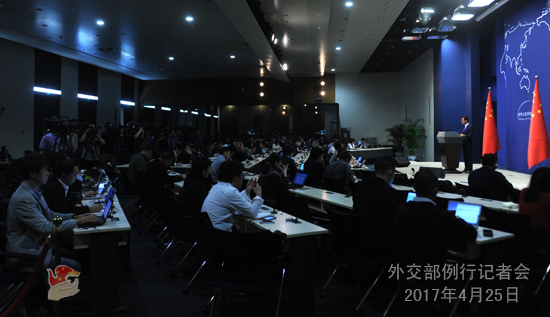 A: You've mentioned several Japanese officials at one breath, but what I can confirm is that Secretary General of the Liberal Democratic Party Toshihiro Nikai will come to China for the High-level Dialogue of the Belt and Road Forum for International Cooperation. Q: The World Health Assembly will be held from 22 to 31 May. Will the Chinese government allow Taiwan to attend? A: My colleagues answered similar questions before. When dealing with issues related to Taiwan's activities in the international arena, we always adhere to the one-China principle.